DiSC is one of the most widely used behavioral style instruments in the world. It can be learned in a day, and effectively utilized the rest of your life. This course provides a common language of behavior that allows you to recognize, understand, and value, the general characteristics of the four basic behavioral styles. It helps you identify your own “core” behavioral style so you can recognize your own strengths and potential limitations. DiSC will guide you into developing an action plan to interact more effectively with others, in any behavioral setting, by addressing their motivating factors, and avoiding their fears. This course is designed to develop people literacy skills. Students will better understand their own behaviors, ways of communicating, as well as the styles of others. They will learn techniques for interacting with others more effectively in a manner that leads to greater performance. Recognize and identify the general characteristics of the four DiSC behavioral styles. Identify your work behavioral style so you can recognize and understand your strengths and potential limitations. Develop an action plan to be more effective in your job and in your interactions with others. 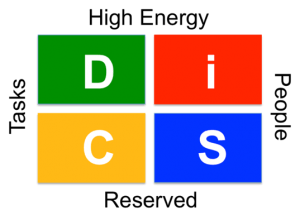 The DiSC model is a well-recognized tool, for understanding differences in individual behaviors. Based on the work of Harvard Psychologist, Dr. William Moulton Marston in the 1920’s, this tool and associated assessment help establish a common language, a basis for mutual understanding, and a greater awareness as to how we interact with one another. How can I change my behaviors?